For the first time in Wolfgang Amadeus Mozart's life, he can't think of a single melody to compose - and he's on a deadline! It's now Monday and he must have a piano concerto composed and ready to perform by Saturday! After doing all he can think of to find inspiration for a melody (including standing on his head and playing the violin in the bathtub), Mozart is at a loss - until his beautiful pet starling begins chirping in protest, wondering why her master hasn't fed her yet. To Mozart, the starling's chirping sounds beautiful and melodious, just the theme he needs for his brand new piano concerto! But when Mozart opens the cage to feed his lovely pet, she flies away. Now Mozart must search the city high and low for his muse, discovering melodies and themes along the way in the street noises of Vienna. 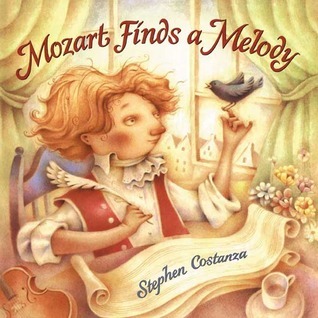 Taking inspiration from a true story about Mozart, Stephen Costanza takes liberties with actual events to create this charming picture book about the famous classical composer. Equally as charming are Costanza's muted yet dreamy illustrations, accompanied by a tad bit of whimsy thrown in for good measure. This book could be used at the beginning of a school year to show students how inspiration is all around us, we just have to be paying attention. Even the genius of Mozart needed a little help from time to time. Kids will surely love this. I am glad the author based it on Mozart. The kids will find this inspirational. Great review Beth!